Sliced, dipped, dredged and fried tomatoes equal a plateful of delights as the showcase of veggie night. It’s an annual treat. 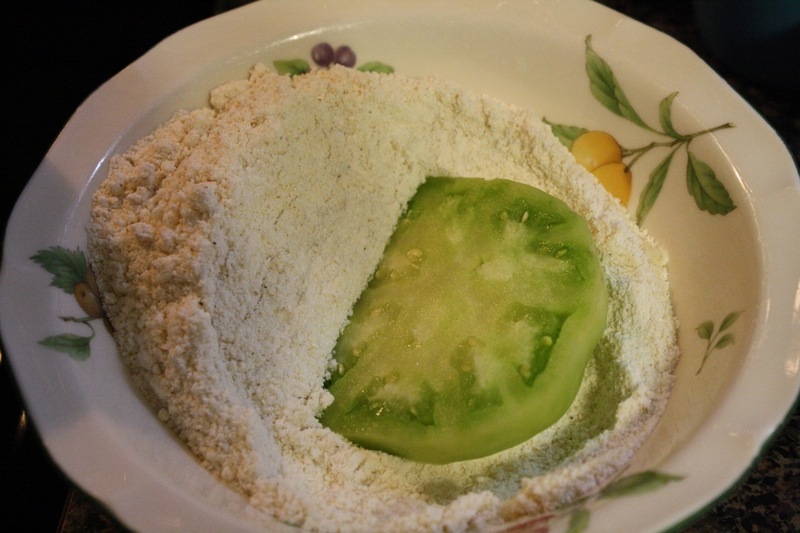 I make fried green tomatoes maybe twice a summer. Veggie plate night, of course being a frugal way to feed our hodgepodge. And fried green tomatoes, of course being a way to liven things up a bit. I explained to the children that fried green tomatoes are served as high dollar appetizers in fine restaurants. So I’ve heard. The taste being similar to fried zucchini but a little more on the tart side. This is the same process I use for fried okra. 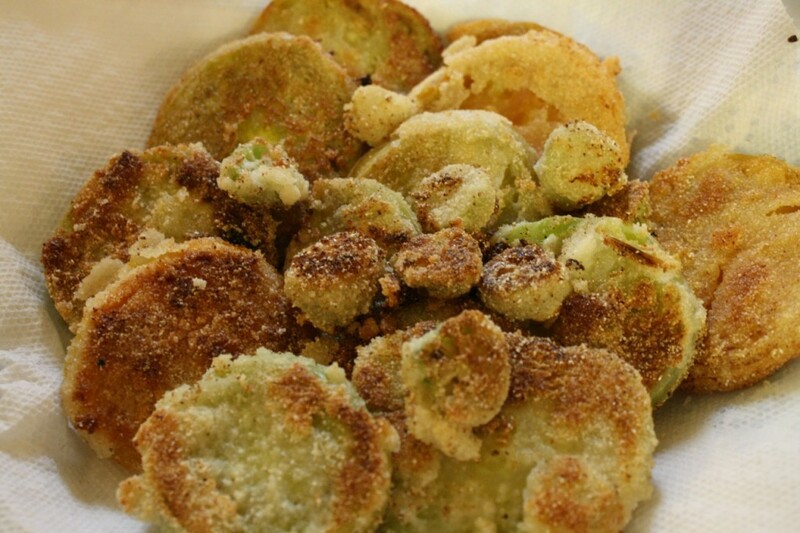 Though standing and frying okra is a true act of love! Slice your tomatoes. Not too thin and not too thick. Fix a cereal bowl full of buttermilk and one full of cornmeal. No certain amounts. Pour your oil in your skillet and heat up on medium high. Dip individual tomato slices first in buttermilk. Drop carefully into the hot oil. Fry less than five minutes on each side. When nice and brown, remove to a paper towel-lined plate to drain. You might want to blot the oil with another paper towel a bit as well. Season to taste with salt and pepper if you like. We didn’t and they were mighty tasty. Serve with cornbread, macaroni and cheese and your other favorite vegetables. We enjoy a veggie plate at least once a week – especially when vegetables are fresh and plentiful. Tasty and frugal! Sweet tea or iced coffee are a bonus for adults. You might also like Erin’s Grilled Green Tomatoes. Get every bite of summer you can! How about you. How often do you enjoy a veggie plate? You must have read my mind! I was looking at all of the green tomatoes in my garden and thinking I couldn’t wait one day longer to pick one. 🙂 Thanks for sharing this very timely recipe. You are a TRUE southerner when you categorize macaroni and cheese as a vegetable! ;o) These look great, I’ll definitely be trying them out! She is definitely a southerner Melissa!!! Yum! I recently fried up sliced squash & zucchini as well as fresh okra. Love, love, love those fried veggies. Mmmm. Squash and zucchini too? Sounds like a feast Jimmie! I like to use seasoning salt and fresh ground pepper before coating in white flour and then frying. They are yummy!!! I agree! This recipe is easily adapted to taste! Why, of course mac & cheese is a vegetable! Fried green tomatoes are the necter of the gods!! One of my tomato plants this year is getting blossom end rot. I pick ’em green as soon as a spot the rot. 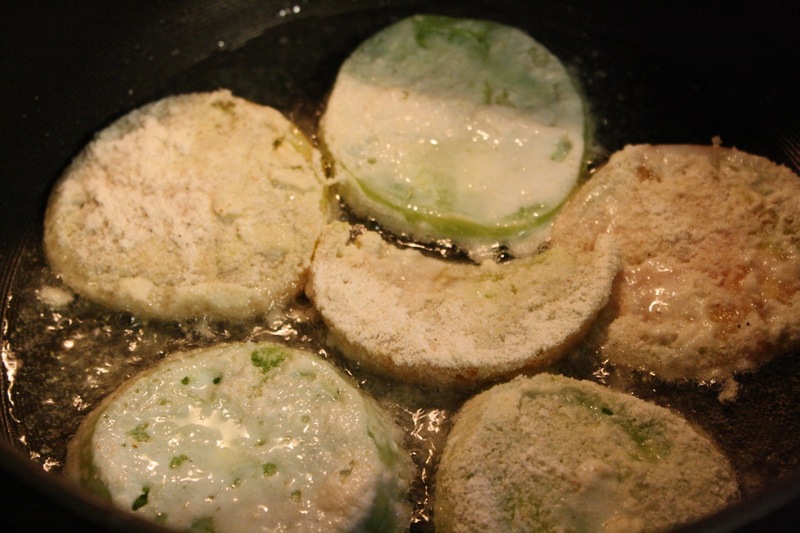 Cut off the bad spot and perfect for fried green tomatoes. Oh so jealous! I love fried green tomatoes but for the first year ever, not only do I not have a garden, but I don’t even know anyone who has a garden. Boo for moving in the midst of fresh produce season. Saw this recipe on Pinterest. 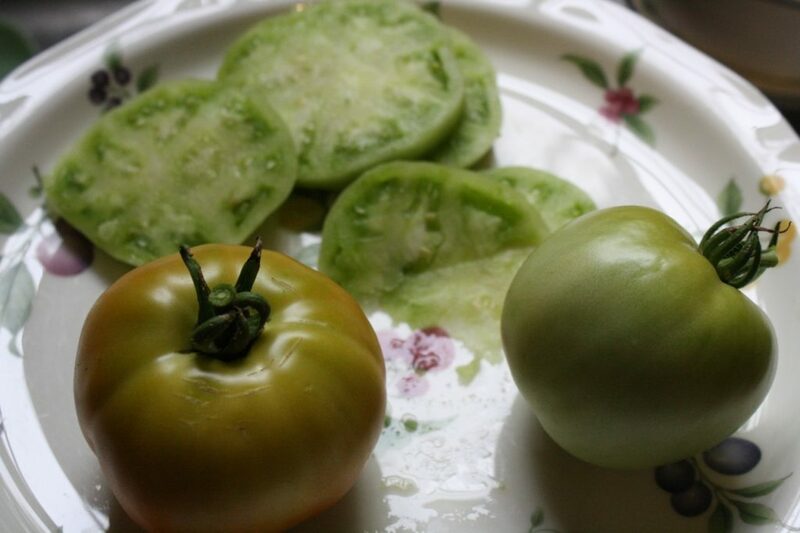 We jst had our first hard frost of the fall and I still ave oodles of green tomatoes. I have always composted or thrown away my green tomatoes..UNTIL now! Thank you fir this super easy and yummy recipe. I am no longer afraid of eating green tomatoes! Thank you! Oh how perfect is that? I would never have thought of fried green tomatoes in the fall! Thanks for the comment – and enjoy!